When Fender first released the Jaguar, it came during the early 60s and certainly had an appearance that was ahead of its time. With an offset-waist body profile which combines a blend of materials including wood, chrome and plastic, the American Professional Jaguar is still as innovative now as it was when it was first introduced. An unmistakable appearance kitted out with futuristic controls, the Jaguar has moved forwards for 2017. The Jaguar was born in 1962 and has its own incredibly striking visual aesthetics which sets it apart from the Fenders that came before it. The American Professional Jaguar has kept the traditional offset curved body shape, an ergonomic design which offers optimal playing comfort. The body has been constructed using alder, a tonewood which is lightweight to hold, but powerful in terms of tone. A shorter 24 inch scale length maple neck is securely fitted to the body. 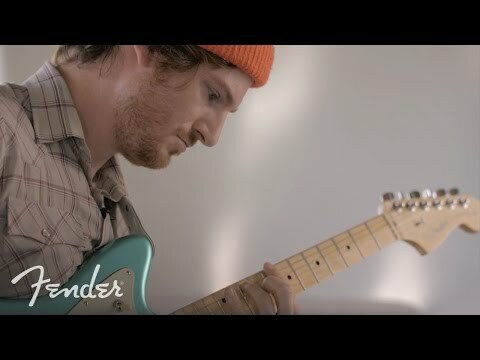 Fender have redesigned the neck by shaping it to the new Modern "Deep C" profile which sits so naturally in the hand. The feel is further improved by the satin urethane finish at the back of the neck. The maple neck has been topped with a 9.5 inch radius exquisite rosewood fingerboard. This sumptuous playing surface is decorated with white dot inlays on its 22 narrow-tall frets which provide ample room for chords and slick string bends. The legendary Michael Frank is well-known for his work in developing superb pickups, and he is the man behind the pair of new V-Mod Jaguar single-coil pickups that the American Professional Jaguar has. This duo of single-coils cover an expansive range of tonal frequencies, with a sizzling output and vintage sound. The Jaguar is equipped with the new treble-bleed tone circuit, so you will never have to lose out on the clarity of high-end notes, thus bringing the Jag tone to life. The Jaguar has always been known for its more unusual control setup, and the American Professional has Master Volume and Tone controls, plus a 2-position slide-switch at the upper bout of the body for in/out phase when both neck and bridge pickups are on. A 4-way pickup blade switch allows for alternating between pickup combinations to explore its sonic palette. The American Professional Jaguar body is fitted with a 9.5 inch radius Jazzmaster/Jaguar bridge with brass Mustang saddles, with a vintage-style floating tremolo, tremolo lock button and a screw-in tremolo arm. The bridge, bone nut and Fender standard cast/sealed staggered tuning machines at the headstock all work simultaneously to enhance sustain and maintain precise string tuning, even after some heavy duty tremolo work. Nickel/chrome hardware, a 3-ply pickguard and skirted amp control knobs complement the finish of the body. Fender also include an Elite molded case with the American Professional Jaguar guitar for ultimate protection.